A collection of various characters spritesheets for creating a 2D action platformer or sidescroller game, especially games with robot, mech, cyborg, war, outer space, futuristic, or techno themes. 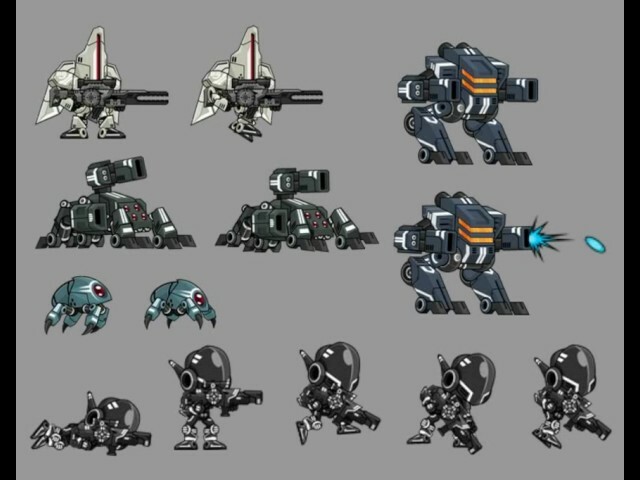 5 mech characters: Trooper, Destroyer, Gunner, Walker, and Mite. Each animation consists of 10 frames. Animation created with Brashmonkey Spriter. Skeletal animation is available, as well as exported .PNG sequence for creating a traditional spritesheet. Spriter Project .SCML file included, along with the body parts images in .PNG format. Body parts made with CorelDraw. Adobe Illustrator .AI and .EPS files also included.